We manufacture these roughing mill rolls from diameter 300 mm to 600 mm and length from 600mm upto 1200mm. The hardness of these roughing mill rolls ranging from 45 degrees to 55 degrees shore C.
Keeping the diverse requirements of customers in mind, we are instrumental in offering superb quality assortment of Roughing Stand Rolls. We are counted among the leading organizations, engaged in supplying premium grade Roughing Mill Rolls. With thorough expertise and understanding of this industry, we are enormously involved in offering a quality assured range of Roughing Stand Rolls. We manufacture roughing mill rolls from diameter 300 mm to 600 mm and length from 600mm to 1200mm. The hardness of these rolls ranging from 45 degrees to 55 degrees shore C.
Being a leading firm in this industry, we are deeply engaged in offering a high-quality range of Roughing Stand Rolls. 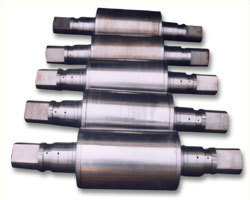 In order to cater to the vast market demands, we are engaged in offering Roughing Stand Rolls.